See a listing on E-Bay and want to discuss it? Want to rant about Ebay? All E-Bay related discussion should go here. Just my angry complaints of the day. Please , to all Ebay seller, STOP to use the Ebay Global Shipping Program option , This option is a perfect scam for foreign bidder !! A crazy shipping cost , crazy fees (for me and for the seller ! ), and many other trouble if the package is lost, destroyed, …. ! So , Please ,do not use this option anymore , Please. Well , that was my angry complaint of the day. It does cost a bit more for shipping and extra fees like duties that the buyer pays. But for the seller it's the best option for international shipping. The seller just ships it to the Global Shipping Center using whatever method they choose. An experienced international shipping company does the rest including customs forms, international shipping, and import fees. The GSP also includes end-to-end international tracking. As the seller the responsibility ends once the item reaches the Global Shipping Center. If the item is lost or damaged during international transit, the Program has you covered. No negative feedback for the seller or refunds by the seller. I do agree On big heavy items the shipping cost can be crazy. You can contact the seller and see if there is an alternative and if they'll use it. Sellers lucky enough to be near a port always have the option of Cargo freight by sea. It's slow and usually takes several weeks. End destination isn't always close. The company I've used doesn't ship by weight but by cubic meter. 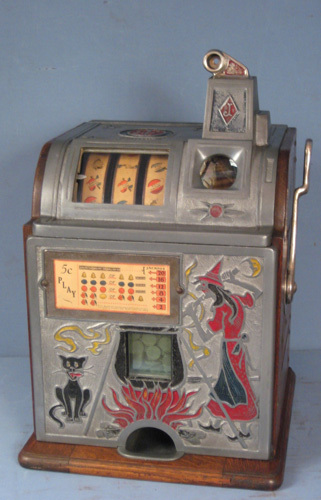 A slot machine from Los Angeles to Bremen Germany is about $100 without the crating. There is USPS flat rate international for smaller items if the seller will work with you. Before the global shipping program sellers excluded the countries they wouldn't ship to. I think most slot machine and parts sellers would work with the European countries that has the buyers. Last week , I bought two item ,2 different auctions ,but the same seller. 35$ each item. If he send it to USA , it s Free( great ,thank you); for a standard shipping to France , arround 15$ for the 2 items. ,So big total 85$ ! For this price , no customs fees in France . But with the Global shipping, 33$ +15$(shipping) +15$ customs fees = 66$ X2 (because impossible to combine shipping !) = big total 130$ ! 45$ in the ebay's Pocket and add also your EBay fees and the paypal fees( paypal is from EBay), so for two item at 66$ ,more than 50$ go to eBay !!! if it s not a scam , what is it ?? And you have the big total of the fees only when the auction is finish. At the beginning ,you have just the shipping cost ( with sometime a good price),but when the auction is closed , you received the total fees ,and Fu..K . And impossible to remove the option, no other way to delette the auction or have an USA address. You say that is a good solution for sell in Europe ,sure , more easy for the seller , but since this Scam of Global shipping ,all my friends and nearly me don t buy anymore in USA !! So I don t think that is the best way for touch the europeen buyer. 6 month ago , that was 10% of my bid with the global shipping , The solution was to pay or to ask to a good friend for received them (thank you so much Jim and Larry!! ).But now it s nearly 80% . This solution was a big HELP when sellers who don t want to send to France (I know, Frenchs guys are stupid !! ) , but now, I can't ask anymore to my friends to receive all my auctions ? They will hate me ! And for sure if it s for a Complet machine , impossible to buy it via EBay, but only directly with the seller . Via EBay with global shipping , a slot bought for 1000$ , I need to add 1500$ for received it at home !! Dirshoff ,if you can give me more info about your Company for the shipping , you are welcome . At all Europeen buyer ,if you want add Something please post a reply . Thank you and sorry about this Angry complaint (I have some other , but I keep them for me ! ). It’s ablecargo.com that does the international shipping out of the Los Angeles area. The item has to be crated and dropped off at their location. They mainly ship vehicles and add the crate to the container. I think they do have a destination port in France. I have a cabinet guy that builds crates for me. He glues and screws them with a removable opening. Drops it off, I pack the item, screw the cover on & ship. All the wood is lightweight with the inside being 1” x x” for strength. Pic is last crate he built that was shipped in the USA. Maybe you can pre arrange with your seller to crate and ship to the cargo company or a friend nearby. Everything is possible. eBay sold Paypal so they are no longer the same company. Some sellers will work with you on shipping and some won’t. It’s a matter if you have to have the item or not. I’ve seen what buyers pay thru the global shipping program & the OMG moment. Let me know if I can give you any more info and good luck. Thank you for all this infos . But when I see your so nice package , I can't imagine to buy a Slot machine and tell to the seller : "look this , it s what I want "! Especially if this guy was not ready to send to France !! But I can dream !! And I see that nobody in Europe (Except me and Mills) have trouble with the EBay global shipping . No more messages from European guys on this thread. Well, I think that I m just a stupid French who don t understand that is not a scam .